OUR PRICE: $1.84 - Join Rewards Get $1 Dance Dollars On This Item! The essential! Firm and long lasting 3/4. I got these elastics with my Gaynor Minden pointe shoes and the were amazing! They held up surprisingly longer than all the others I've tried. Then when I switched to Bloch shoes, the matched the color as well! They are amazing elastics and are an awesome price! These ribbons are great. They are the perfect color (always a concern). I wear them with Grishko shoes and Gaynor Minden TLC ribbon. I gave them four stars for durability because they tend to wear out after a while, but I have yet to find and elastic that doesn't eventually wear out. Overall a necessity, I would definitely recommend. These are the right size and elasticity for my DD. She prefers a good resistance elastic. Wish they would come in a roll! We use them on Bloch and Freed pointe shoes. This elastic gives great support. 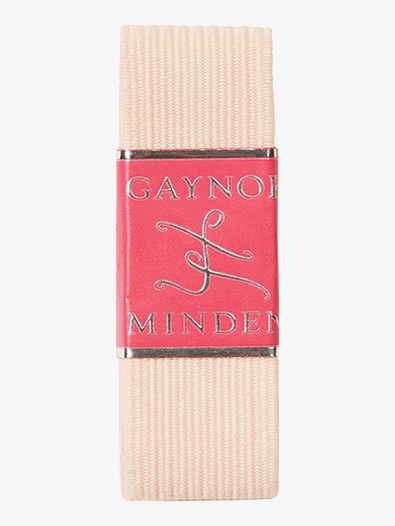 I use it on all my pointe and demi pointe shoes - no matter what brand of shoes, I always get gaynor minded elastic, It is the best i have ever tried. i keep going back to it every time I try a different one. This was my first time ordering ribbons and elastics online, and I ordered the wrong brand. They were unsupportive and too stretchy compared to my old ones, and a lot thinner and pinker too. I really love this elastic. It's the perfect match to all of my tights, super comfortable, and just overall great. The only downside to this is there isn't enough to do a criss cross over the foot. You can only do the loop around the ankle. There is more than enough for that though. And if you bought two packs you could do the criss cross. I only wish they sold this by the bolt. I have tried several different kinds of elastic, both ordered online and the elastics I get with pointe shoes at my local store. These are by far the most comfortable. They are also pretty durable and definitely re-useable for future pairs of shoes. The color is nice, too, and works well with most brands of pointe shoes. This is the only elastic I use. The color looks great with any brand of pointe shoes, and it comes with just enough elastic to sew it on as tight or as loose as you want. I have tried many different elastics, from Bunheads to Freed, and Gaynor Minden is by far my favorite! It's the perfect amount of stretch and it's very strong. The color blends well with all of my tights. I only do the single-loop on my shoes, but they give you enough for criss-cross. Try this elastic! It's amazing! This product is very good, but it is only enough for one pointe shoe if you sew on heel loops to help secure the ribbons like I do. Strong and the perfect color for "theatrical pink" rights (not the salmony "ballet" pink). I can use the same pieces of elastic on a few pairs of shoes. Recently tried Freed because the color of the GM is very pale. Big mistake. The GM elastic is stronger and softer against bare skin, with just the right amount of stretch (Freed was too stretchy to be as effective, and felt rough in comparison). I use two packages and crisscross. No ribbons needed for fast off/on. Actually more secure than the one ankle elastic and ribbons. Definitely the best choice of the wide traditional elastics. We've used this elastic for years on my daughter's shoes but the elastic has been shorter the last two times I've ordered it. She crisscrosses her elastic and it now takes four packages of elastic for one pair of shoes instead of two packages. I wish Gaynor Minden hadn't decided to cut this corner (literally!). This elastic is awesome. It was easy to sew, holds up well (no fraying/unraveling), and is very supportive. I always had problems with my shoe slipping off my narrow heels, and the strength of these totally took care of it. I wear Grishko 2007s and the color matches perfectly. I love this elastic! It's the perfect color, and it's comfortable. If you cross your elastics just get 2, and it's perfect! The color blends well with all my tights and is strong. Excellent hold and re-usable for multiple pairs of shoes. I like this elastic, because it has the perfect balance of stretch and hold. The color blends in nicely with my tights. This elastic is wonderful!Very supportive and blends well with my Bloch pointe shoes. Just make sure you order two if you like to criss/cross, because I had to order more after I did one shoe. I always use this elastic on my pointe shoes. I tried a thinner kind of elastic that I got at my local dance supply store first, but this elastic is WAY stronger and I am much more comfortable in my shoes when they have this thicker elastic. I don't have super-arched feet, so I'm not sure how well it would hold for someone who is over-arching out of their shoes, but for me, it's great! PS. I have to order two packs per pair of shoes because I like to cross my elastics. These are already cut the perfect length for me - I don't need to cut them at all! All I need to do is burn and sew. I like the amount of support they give me, because they are flexible and non-restricting, yet durable and supportive at the same time. They are the perfect color - especially for Gaynor Minden pointe shoes. They also blend well with the Gaynor Minden tights. This pink is very soft to be hidden with the ballet-pink tights color. It would be great if there is stronger elastic support. Does this elastic come pre-cut? This item comes as 15 inches long and 3/4 wide. It is one piece of elastic.